$3,000.00 plus $125 shipping and insurance within the Continental United States. For local sales, shipping charge will be allocated to NYS Sales Tax. Please email me at JamieWG@aol.com for International purchases or with any questions. 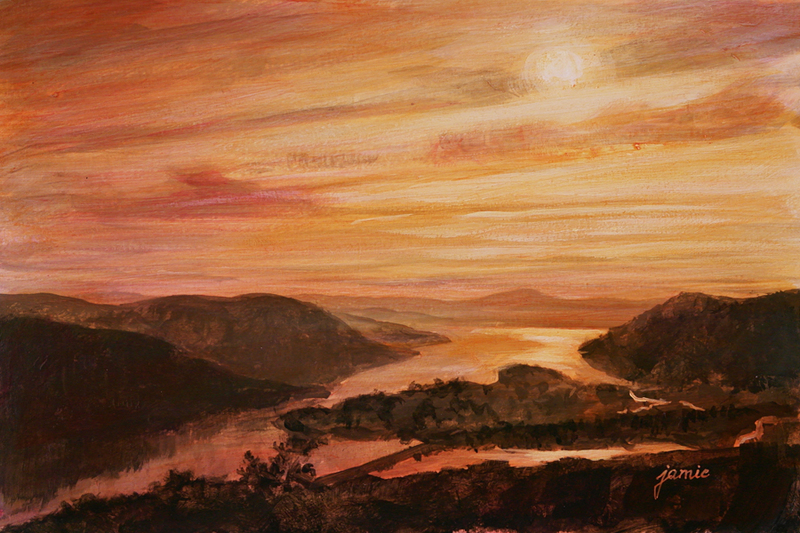 This Catskills scene from North South Lake, made famous by Hudson River School artists Thomas Cole and Jasper Cropsey, is a large format painting in warm sunset colors of golds and rusts. 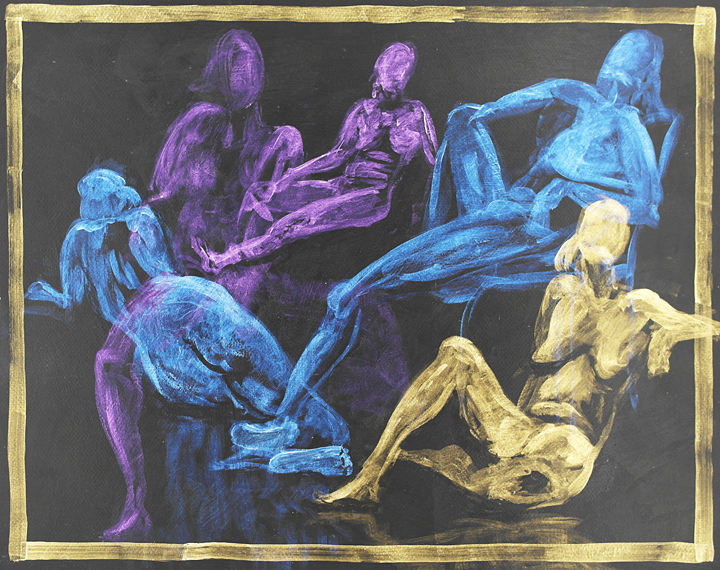 It is from my series of works done in analogous colors, which harmonizes the palette by using only colors adjacent to one another on the color wheel. I found the warm-colored paintings of that series to be more challenging to paint in some ways, but often more rewarding too! This is one of my personal favorites from the series. $2,800.00 plus $100 shipping and insurance within the Continental United States. For local sales, shipping charge will be allocated to NYS Sales Tax. Please email me at JamieWG@aol.com for International purchases or with any questions. At Olana, the estate of Hudson River School painter Frederic Church, there is a western view from a lesser-known path of the Hudson River and the Catskills. It’s the most dramatic vista from the property for me because of the fantastic skyline of the mountains, and the fact that it faces due west at sunset. On this particular visit, I was able to catch the sun rays streaming from the cloud forms as the colors changed. I did a quick painting on location, and captured some photos for additional paintings like this one. Below is an image you can click on for a larger, clearer view of the painting. This large painting of the Hudson River and Palisades was done as a commission, so it is already spoken for. You can see some available paintings I have of the Palisades and Hudson River by clicking the categories on the right side of my website, or click here to pull up my Palisade paintings, then scroll down to see them. Large paintings are very difficult to store, so I generally do them on a commission basis. I’m always happy to paint a special commission for you if you don’t see the size/scene/season you’re looking for! 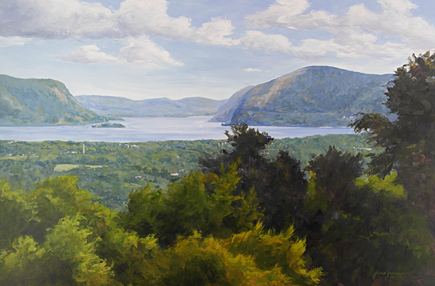 This fabulous view of the northern gateway to the Hudson Highlands is one of my favorite Hudson River vistas. You can see Bannerman Island, with Storm King Mountain on the right, and Breakneck Ridge in Cold Spring on the left. I painted it from a photo, taken with a telephoto lens at a distance, which amplifies the atmospheric effects of the distance. Infused with the blues and greens of summer, it exudes tranquility. We can all use a bit of that! This is a large painting with an expansive feel, and would be a great centerpiece over a sofa. Below is an image you can click on for a slightly larger view of the painting. The other day, I varnished ten of my new Hudson River and Hudson Valley paintings. They range from scenes overlooking the Hudson River and Palisades from New York City, to Peach Lake in Brewster, and Burger Hill in Rhinebeck, up to the ledges of Sunset Rock overlooking North South Lake (beloved Hudson River School site), and the Catskill Mountains. 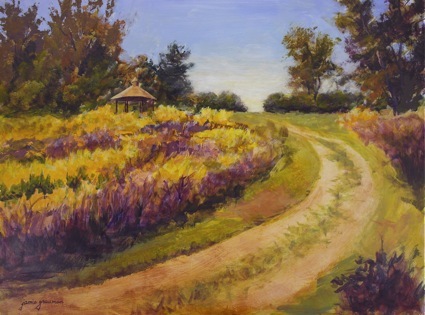 Some of these were started on location and finished up in the studio, while others were painted from my photos and other plein air paintings. They represent much of the terrain I’ve traversed over the past six months or so, in search of the best of what the Hudson Valley has to offer my muse. The varnishing process takes time to set up, so I like to do large batches at a time. Usually that means about 17-20 paintings. Lately I’ve worked on some larger pieces, which has lowered my production in terms of quantity. Working on those big paintings has meant that the little ones tend to hang out in the studio longer, before they get photographed, varnished, and up on my website. As the weeks go by, they get more touchups and adjustments as I see them. I think this has led to an overall increase in quality. As I look at this set of paintings now, I’m really happy with what I’ve achieved in this batch. Here’s a photo that you can click on, and you can then zoom in on specific paintings. 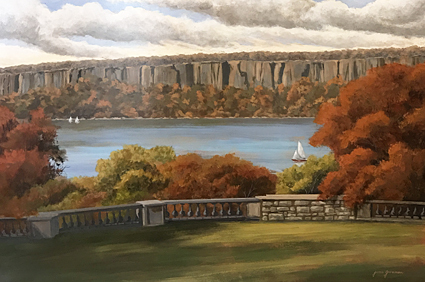 The large, framed painting of the Hudson River and Palisades is already spoken for, and out the door. (I do miss that one already! But there is a smaller version of it available among the others, and I can always do another large one for you on a commission basis.) The smaller works above it are all available and in search of new homes. If you see one that interests you, send me off an email (or comment below), and I’ll get back to you with more information. They will all be posted individually as I adjust the single images. Some of those have already been posted with prices, and are visible by going to my home page and scrolling down. This painting was a long time in the planning! Several years ago, I went to a Hudson River overlook at Bear Mountain very early in the morning. It is on the western side of the river, so the sun was coming in toward me. The light streaming from the east silhouetted the land forms, and warm color streamed toward me from the eastern sky, reflecting in the water. I did a 5×7″ plein air, attempting to catch the fleeting light and color, while knowing it would all be gone in ten minutes. You can see that painting at this link. 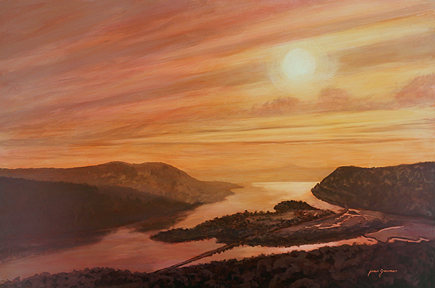 Since then, I’ve done a few paintings based on that study, featuring the view over Iona Island and the warm, early morning light. The one at this link was a 6×9″ color study in golden hues. 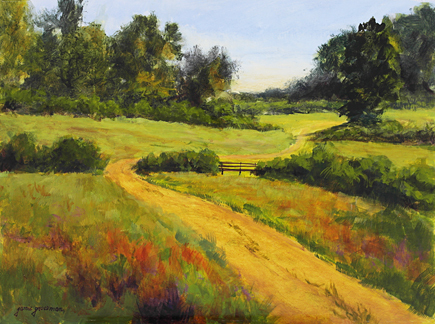 Another 6×9″ color study, with the orange hues as in the larger painting featured in this post, is currently at RiverWinds Gallery. I liked them both and it was hard to decide which one to go with for the large painting. In the end I decided to use the copper tones, building multiple layers of warm glaze colors over a monochrome underpainting. Below is an image you can click on for a larger view of the painting. $2,800.00 plus $125 shipping and insurance within the Continental United States. For local sales, shipping charge will be allocated to NYS Sales Tax. Please email me at JamieWG@aol.com for International purchases or with any questions. Many years ago, I went sketching with a friend along the Hudson River in Newburgh. It was a cold winter day, so we found a parking lot with a river view, and sketched from our cars with the heat running! There were geese swimming in the frigid, but still open water. 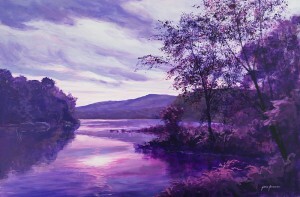 I always wanted to do a large painting of this scene, with the bright sunlight streaming from the south and reflecting in the water. I decided to do this painting in blues and violets to give it the cold winter feeling I had on that day, while adding the violets to keep the color harmony, yet expand the color range. 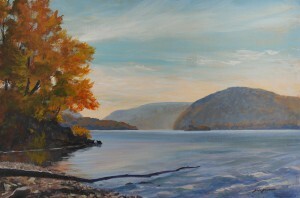 I wanted this Hudson River painting to depict the colors of a summer day on vacation, and to take me to that “happy place” with all the time in the world, and without cares. I think I captured the warm Caribbean feel I was after, while maintaining the strong sense of the Hudson that the mountains of the Hudson Highlands provide. 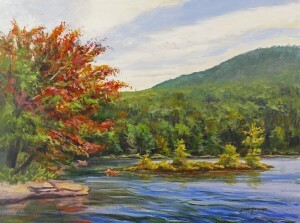 The photo for this painting was taken out on the river near Beacon. Below is an image that you can click on for a larger view of the painting. 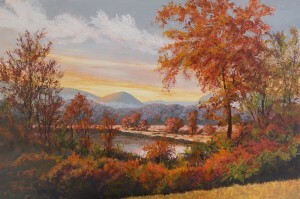 I have painted this scene many times out on location in Beacon. It is where Fishkill Creek enters into the Hudson River at Madam Brett Park. 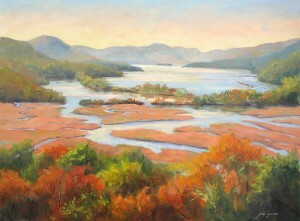 Although beautiful in all seasons, the marsh and foliage blazes with warm color in Autumn. 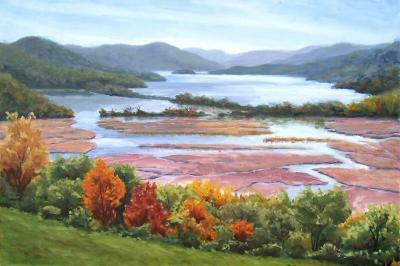 For that reason, I selected this scene to portray the “Red Orange” painting of my recent series, Hudson Valley Hues. The painting is currently available at RiverWinds Gallery (see link above), and will be offered at a special price only for the duration of the show. Below is an image you can click on for a larger, clearer view of the painting. This painting was also the main image for the show card. Solo Show at RiverWinds Gallery in Beacon, NY! 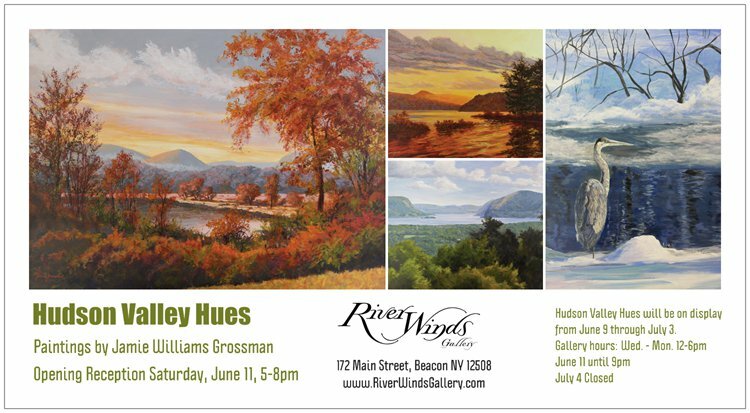 I hope you can join me on Saturday, June 11 from 5-8pm at RiverWinds Gallery to celebrate the opening of my solo show, Hudson Valley Hues. I’ll have 11, 24×36″ paintings in the show, plus an assortment of new little ones just off the easel. I have been working on this series of paintings for two years. 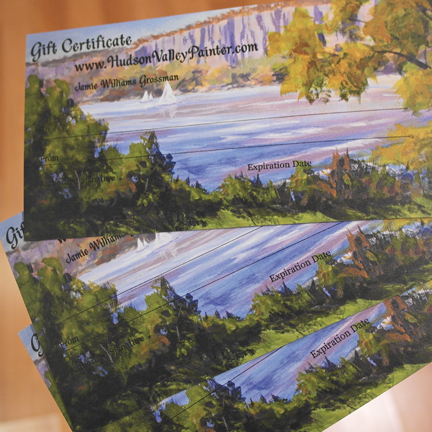 They are paintings of my favorite scenes throughout the Hudson River Valley. I’m so happy to finally be able to share and show them. For those who cannot make it to the opening reception, the show will run from June 9 through July 3. 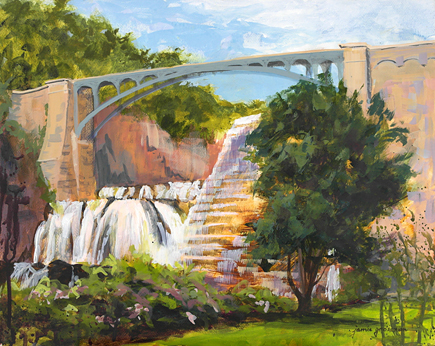 The gallery is located at 172 Main Street in Beacon. Hours are Wednesday through Monday from 12-6pm. Please stop by and see the show if you can! $3,800.00 plus $125 shipping and insurance within the Continental United States. For local sales, shipping charge will be allocated to NYS Sales Tax. Please email me at JamieWG@aol.com for International purchases or with any questions. If you think you’re having a deja vu moment, this painting is similar to the one I posted last week! I took a series of photos of the Great Blue Heron in my yard. 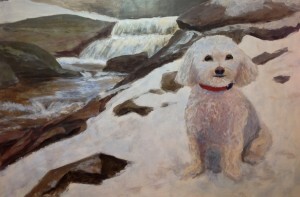 Here he is in a more upright pose, and it is a more detailed and refined painting. This painting is all done in shades of blue. Below is an image that you can click on for a larger, clearer view of the painting. 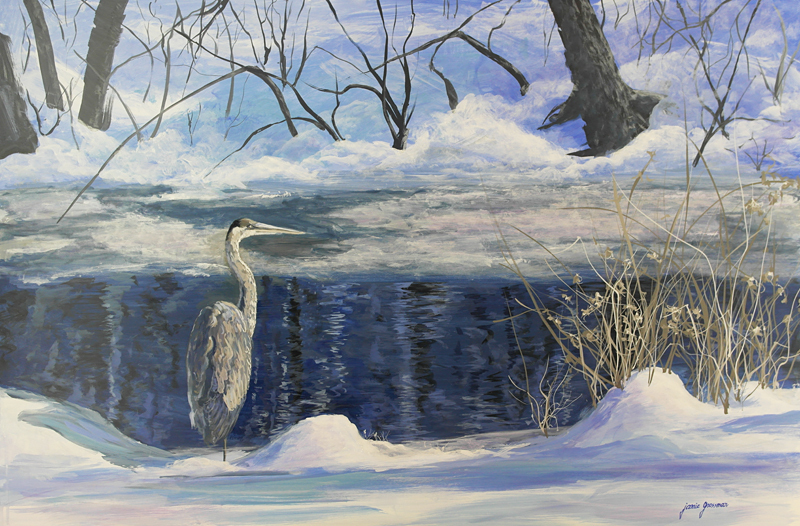 This Great Blue Heron usually sticks around for the whole winter. I took a bunch of photos of him from my kitchen window, and painted him in a palette of cool winter blues, huddled against the cold. The painting developed a few small ripples in the process of wet-mounting the paper to a board after the painting was completed. With the painting hanging on the wall, you have to really look carefully to be able to even see them. With that disclosure, I am offering The Big Chill at a huge discount of more than 50%. In spite of the minor flaw, the painting is beautiful and is totally archival. 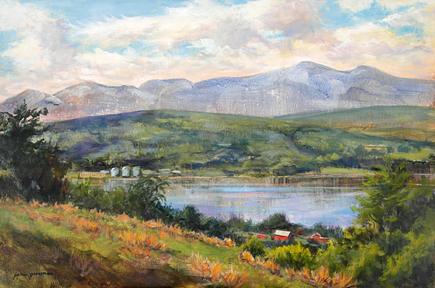 It is varnished to be framed without glass, like an oil painting. $1,150.00 plus $35 shipping and insurance within the Continental United States. For local sales, shipping charge will be allocated to NYS Sales Tax. Please email me at JamieWG@aol.com for International purchases or with any questions. This painting was recently rented for a gallery scene in the new, upcoming HBO series, “Divorce”! It was exciting to work with a production company. I was impressed with the way they handled all the details in such a short time frame. I’m looking forward to seeing three of my paintings, including this one, in the final episode of the first season. There was no word on when the series was going to air, but possibly over the summer or in the fall. $2,100.00 plus $125 shipping and insurance within the Continental United States. For local sales, shipping charge will be allocated to NYS Sales Tax. Please email me at JamieWG@aol.com for International purchases or with any questions. This large, colorful, splashy acrylic was painted on site at Olana, overlooking the Hudson River. It’s probably my favorite Hudson River view, and I’ve painted it on location a number of times in smaller formats. 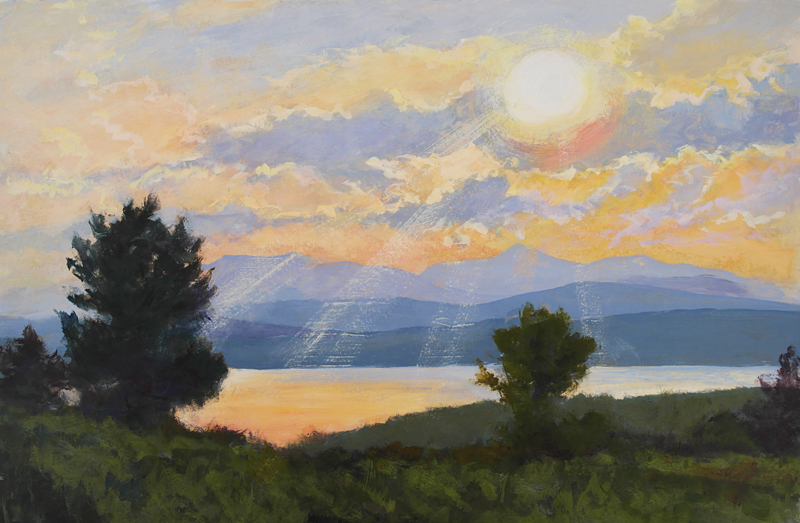 I always think about how many Hudson River School painters stood in this very spot, gazing at the distant Catskill Mountains while trying to capture the light and scenery here. I didn’t have a setup to photograph large works very well until recently, so this large spring scene hasn’t yet made its debut on my website! It’s a perfect size for over a sofa, mantle or dining room wall. Below is an image you can click on for a larger, clearer view of the painting. This was painted on location at a horse rescue farm. The rolling hills and tree lines made for a beautiful setting. The path didn’t exist, but I did a few preliminary sketches and felt it added a lot to the composition, so I pulled out my Artistic License and put it in there! Below is an image you can click on for a larger, clearer view of the painting. $750.00 plus $35 shipping and insurance within the Continental United States. For local sales, shipping charge will be allocated to NYS Sales Tax. Please email me at JamieWG@aol.com for International purchases or with any questions. 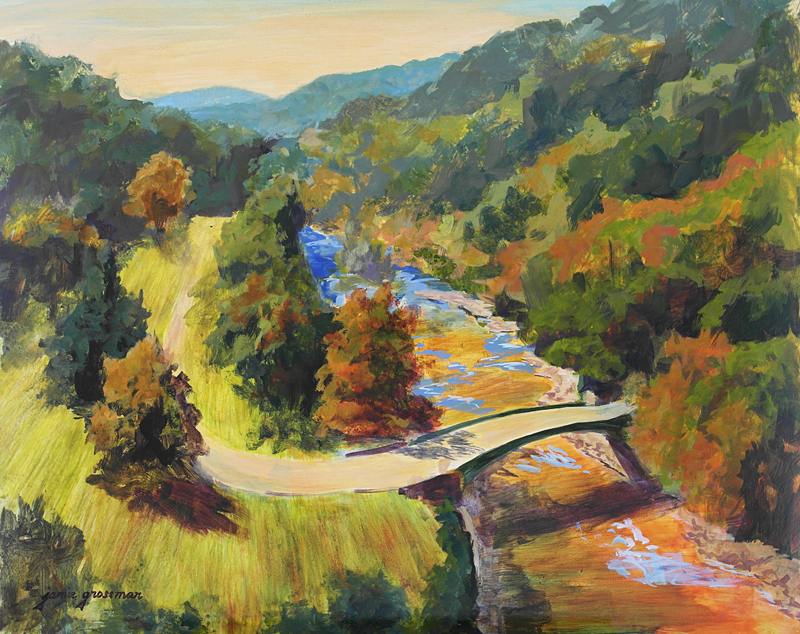 This was painted from the top of Croton Dam on a brilliant fall day, looking down upon the park and the bridge that crosses over the river. Below is an image you can click on for a larger, clearer view of the painting. 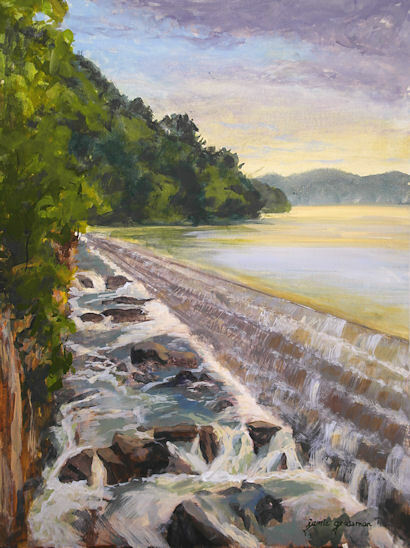 There are several wonderful views of Croton Gorge Dam, and great vistas from the bridge at the top as well. I was in a splashy acrylic mood on this day, and let the drips and splatters become part of the painting. This was painted mostly with the Golden High Flow acrylics, which have an ink-like consistency. They form a permanent shield just like other acrylics, so that they get sealed, varnished, and framed without glass, just like oil paintings. Below is an image that you can click on for a larger, clearer view of the painting. Stay tuned for the view from the top, coming up in a few days. $850.00 plus $35 shipping and insurance within the Continental United States. For local sales, shipping charge will be allocated to NYS Sales Tax. Please email me at JamieWG@aol.com for International purchases or with any questions. 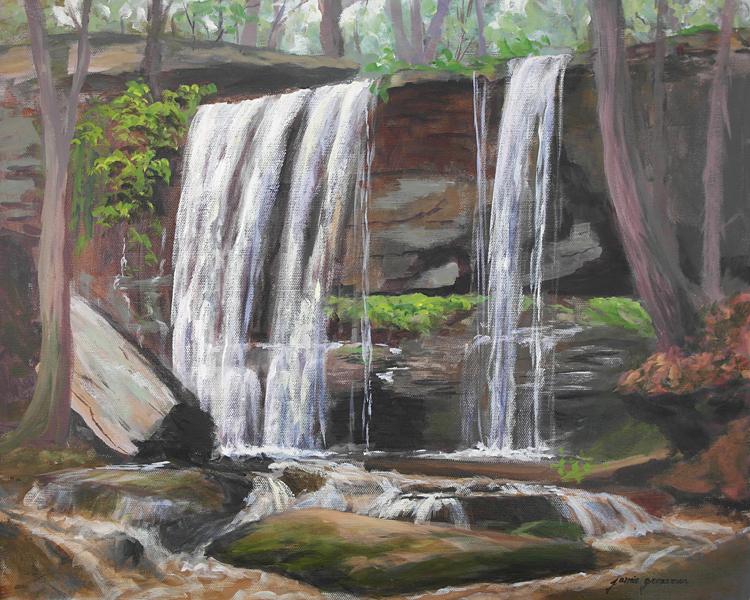 This waterfall is nestled deep in the woods behind my house, so I go there to paint frequently. Following a rainfall, the sound is a roar as the water hits the base of the falls and rushes down the many cascades below. $400.00 plus $20 shipping and insurance within the Continental United States. For local sales, shipping charge will be allocated to NYS Sales Tax. Please email me at JamieWG@aol.com for International purchases or with any questions. This montage was done in open studio, using iridescent and interference acrylics. It makes the painting hard to photograph due to the glimmering of the paint. It is a very challenging way to work because you never know what pose the model will take next! You can end up with an empty space on the panel, and a pose that doesn’t suit the space. Some of them work out compositionally and some don’t. I felt this was one of the lucky ones, where all the poses could work together. I love doing these. It’s so different from the other work I do, and gives me the opportunity to work outside of my box. $2,500.00 plus $125 shipping and insurance within the Continental United States. For local sales, shipping charge will be allocated to NYS Sales Tax. Please email me at JamieWG@aol.com for International purchases or with any questions. $3,600.00 plus $125 shipping and insurance within the Continental United States. For local sales, shipping charge will be allocated to NYS Sales Tax. Please email me at JamieWG@aol.com for International purchases or with any questions. 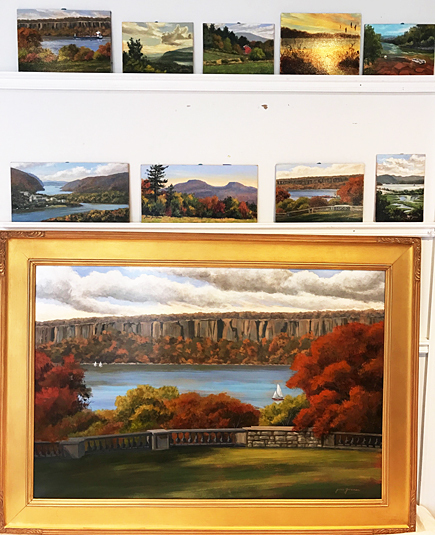 This is a large oil painting done over a period of several days on location at the Boscobel Restoration in Fall, with some finishing touches completed in the studio. It is the famous view from the bluff above the Hudson River, overlooking Consitution Marsh. I’ve painted this scene many times in every season but winter! The marsh glows red in the fall and it’s a spectacular sight come late October. 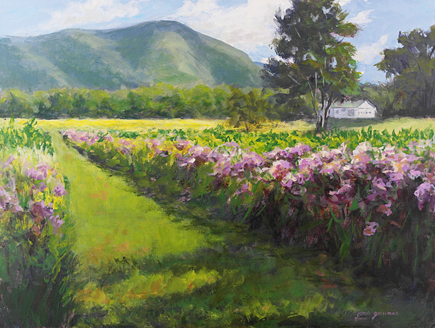 I’ve recently sold two medium sized paintings done on location at Boscobel. This large fall scene is available, varnished and ready to ship, so I thought I’d bump it to the top. They do tend to get buried in the mountain here on my blog site after awhile! 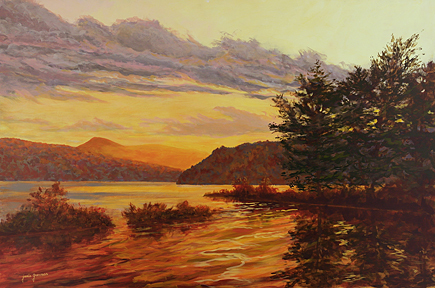 There are a couple of available 16×20″ Boscobel paintings too, plus an 18×24 and a few smaller ones. I like to believe that Frederic Church would have liked this concept of his home, Olana. This is one of those cases when the painting sold before I could get a decent image of it. Nevertheless, I thought it would be worth posting because I really want to do more of these monochrome-color compositions. I began with a 9×12″ segment taped off for the centerpiece of the painting. 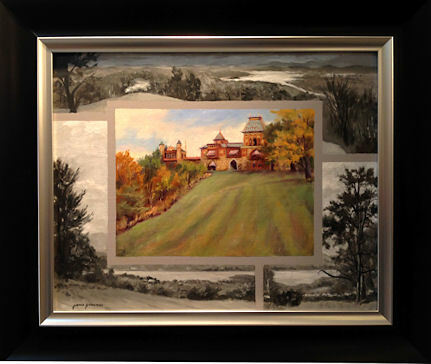 I wandered around Olana, capturing scenes around the estate in shades of gray oil paint as they presented themselves. I figured that once I had the monochrome border sections done, I’d know what to paint for the colorful center to tie it all together. 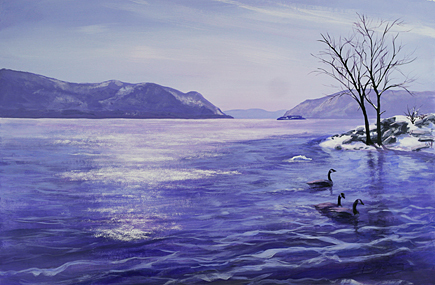 I ended up painting all the black and white sections as Hudson River scenes. 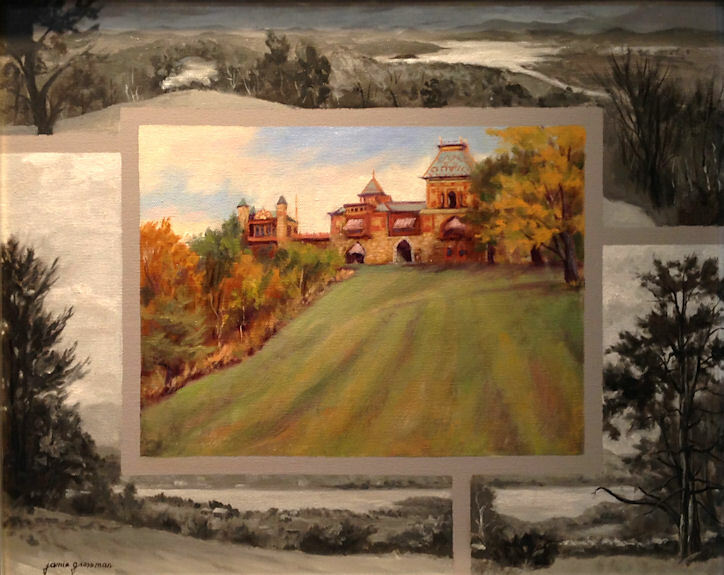 It made sense to use the brilliantly colored mansion as the centerpiece of the painting, set into the views of the Hudson River, just as Olana was the centerpiece of Frederic Church’s universe, surrounded by the gorgeous landscape and river vistas. This was painted for the Olana Plein Air Event, and sold there. $750.00 plus $30 shipping and insurance within the Continental United States. For local sales, shipping charge will be allocated to NYS Sales Tax. Please email me at JamieWG@aol.com for International purchases or with any questions. I tried to make the most of the beautiful autumn days by starting as many paintings during that time as I could, even though I knew it would leave me with a huge pile to complete in the studio. After all, I’ll have all winter to do that! And believe me when I tell you that the pile is big. So, some of the paintings I post during the winter will bring you back to those warmer times when I started them out on location. We can all use a little of that warmth during the winter season! 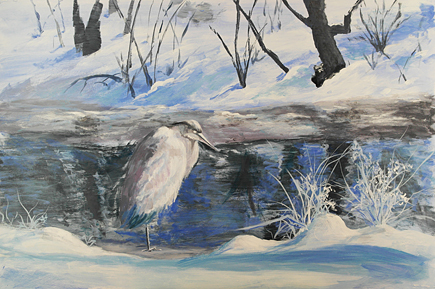 I’m not terribly fond of winter and so I don’t enjoy painting it. It’s not a memory I want to have hanging on my walls when the weather finally improves! Yet, the winter gives me that opportunity to play with new ideas, take my time finishing up the uncompleted works, and exploring other subject matter. You’ll be seeing some interesting things emerge. Stay tuned! 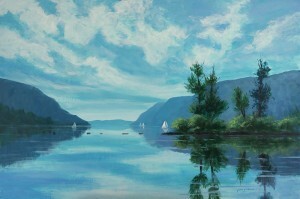 Come see this painting and 16 others that I just dropped off at RiverWinds Gallery, 172 Main Street, Beacon, New York. The opening reception is this Saturday, November 8, from 5-8pm. I’d love to see you there! Bring a friend and do some early holiday shopping. The show will remain up through the holiday season. If you can’t make it this Saturday, you can check out RiverWinds during their regular business hours. You can find directions and their hours on their website. My friend Johanne and I went on a hunt to find out how folks were getting up to the top of the bridge over Croton Dam. We were surprised and delighted to find out that although there is very limited parking, there is an easy paved path and fantastic views from all angles. We went back with our paints and some more friends last Friday and had a wonderful day here, up on top of the world. The weather was picture-perfect, and the slight mist created by the wind and waterfalls kept my acrylics from drying out too fast! I have really fallen in love with this location, both from the bottom facing the dam, and from here at the top.